Sweden metallers IN FLAMES has never been scared of taking chances or pushing boundaries. With over 2.5 million records sold over the past years, their fans wait in fascination and (in some cases) fear of what's coming next. On November 15th, In Flames will unleash their second digital single, 'Where The Dead Ships Dwell', off their new album, Sounds Of A Playground Fading, which was released in June. Sounds Of A Playground Fading has been a new chapter of In Flames' lore, as well as another example of their unique formula for success. The album not only debuted at #27 on the Top 200 Billboard Charts, but landed the #1 spot on the German album charts, as well as debuting in the Top Ten results in Sweden, Finland, Austria and Norway. 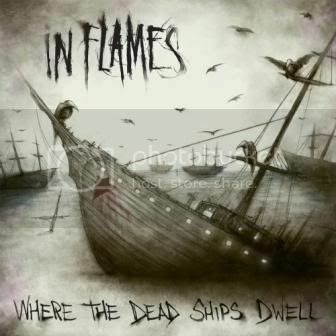 In Flames was not shy of taking a new approach to their song 'Where The Dead Ships Dwell' and went to extremes with the diverse partners that turned in three completely different remixes. With versions by German rapper CASPER, drum and bass act THE QEMISTS and Kristof Bathory, vocalist of the black metal band DAWN OF ASHES, there should be something everyone can enjoy. "The songs have already been made and the originals are as good as they can be, but what if I give them to an artist from a whole different genre, what would be there take on it? ", says In Flames vocalist Anders Fridén. "I love collaborations like this and all the artists we worked with have done an awesome job. It's not meant to be taken dead serious and it's not how In Flames is gonna sound next, but I love it and I hope you'll enjoy a twist to the formula." Casper: "Since I have been a huge In Flames fan since I was a teenager, I was honored to even be considered for a remix of one of their songs from their new chart-topping album. When I used to play in metal bands, it was all about having riffs comparable to these guys and to now, as a rapper (!!! ), be a part of the new single is mindblowing. We didn't really know how to approach the material, since it is my first remix job ever, so we went the dancy French house route. I really deeply do hope that people enjoy it. Feeling blessed." The Qemists: "From the first listen we were blown away by the whole album, so we jumped at the chance to remix one of our favorite tracks from 'Playground. We wanted to create something for the clubs which still embodied the spirit of this album. Going back to the original recordings rather than just having a vocal accapella allowed us to do something with the vocals which would not normally be possible on a remix, and In Flames are a band who obviously like to push the boundaries, so we thought they would probably like our ideas!" Kristof Bathory from Dawn of Ashes: "It was quite an honor to work on this remix & add an Industrial vibe to an In Flames track. I feel that my evil ways definitely comes out in this remix. So for In Flames fans, enjoy my Devilry!"